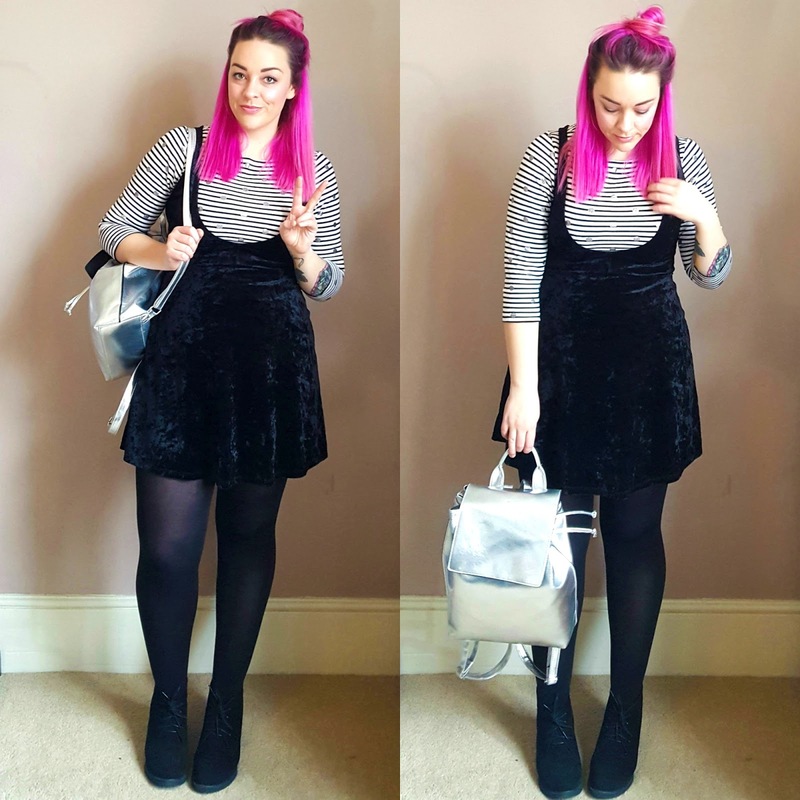 i've totally got this thing for velvet at the moment, but i'm not entirely sure why. this dress was my first investment, of what's so far a collection of three. then came the silver top, then the pink dress. there were even a couple of pairs of velvet sock boots that were nevvvvvver going to fit or suit me, but i wanted to just own them, if only for a day. but this is the one that kicked off the new addiction. i nabbed in h&m in late november, in a hurried shopping trip before dinner on oxford street. i saw it, knew it would fit as i have the same dress in another colour, and just bought it without a second thought. which is just as well, because it's the absolutely perfect dress to pair with latest purchase from depop. i randomly clicked into depop to see if my pal alice had anymore nice things to sell me, and stumbled across sally. 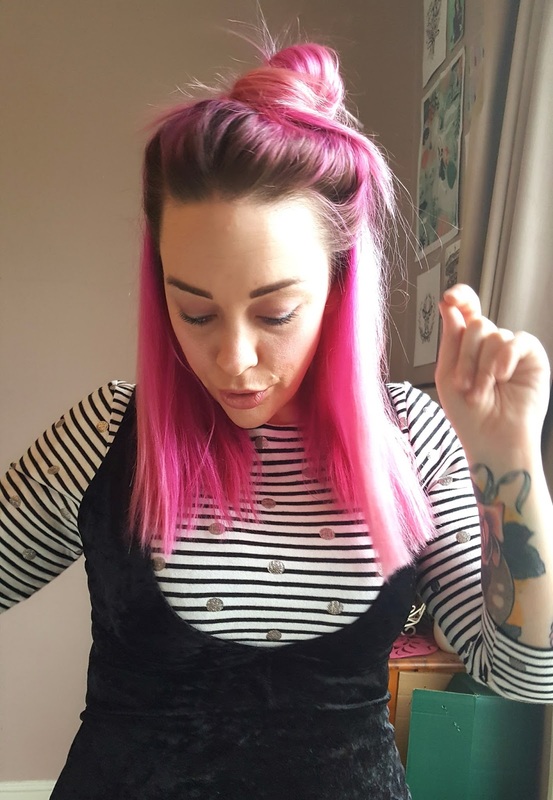 i've been reading sally's blog for a hundred year, but didn't know she was on depop - nor thought any of her stuff would fit me because she's teeny tiny and fits in dolls clothes. but, saw this super pretty joules breton top on her profile, brand new and never worn, for a tenner, in my size. lord knows how that worked out so well, but it did, and now the top is mine! i'm not a massive fan of stripes, but they've been a pattern i've slowly started to add to the rota of acceptable patterns i can wear. the list now includes: polka dots, stripes, and some floral. yes, a very short list. but! the thing i loved most about this breton, is that it has the shimmery, glittery silver polka dots all over the print as well as the stripes! and, the polka dots are embroidered on with lurex, so they will never fade or fall off. it's so flippen cute, it had to be mine.. and now it is. which is just as well, as the top perfectly compliments my new backpack, and my new dress. so much so that i've turned the dress around and worn it back-to-front just to get more exposure of the top. tricky!